And some scanned stuff, and some prose, but mostly pictures. 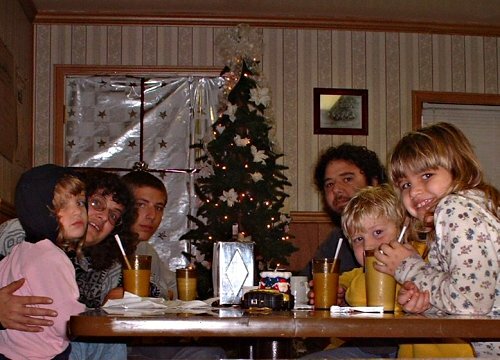 This section of the web site is devoted to my family and our personal lives. Since the spring of 2004 we have been back from 2 years living in Shanghai China. Linked at the right is other "Family" material, and whatever else interesting that the kids produce. 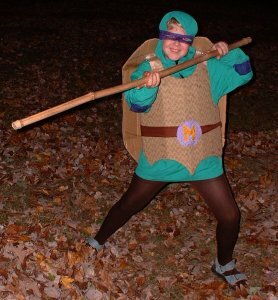 This year Max decided early that he wanted to be a "Teenage Mutant Ninja Turtle". Asa settled a few weeks ago on "Birdman", a character that he saw on the Cartoon Network when we were in Hawaii this past New Years. 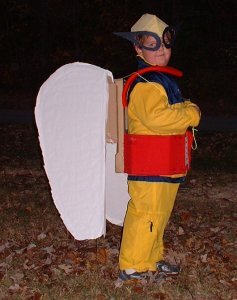 We had strongly suggested to the boys that we were not going to spend money on pre-made costumes this year and as I have a (well deserved) reputation for the ability to make anything out of cardboard, I saw the turtle shell as an interesting challenge. 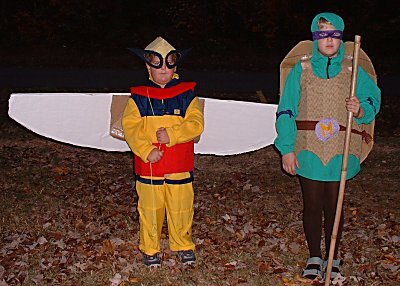 I figured that I'd be able to knock out some wings for Asa's costume in a couple of hours, and show the boys how much fun making a costume can be. Let's just say that after the 20 or so hours I've invested in these cardboard costumes I'm not sure that there was any economy achieved, but they were both looking good tonight. I neglected to get a shot of the back of Max's turtle shell to show off my mastery of the compound curve realized in corrugated cardboard, but you can see the string in Asa's hand that he pulls to move his wings from the relaxed to the spread positions (a pretty cool mechanism if I do say do myself). Of course I overbuilt both of them, so I hope that they'll get several more hours of quality play time before being discarded. This is the first "self timer" picture with the new camera. I cut off the bottom half 'cuz it's just the table cloth, but other than that, I didn't crop it at all. I love how the machine chose to frame us. Vérité baby! It's at "Le Coco", a local dining establishment known for it's lavish breakfasts. The menu is certainly replete with elaborate (and colorfully named) breakfast options, but the service was lackadaisical, and with the hot chocolate for the kids, the tab was over $30.00 - for breakfast.